There is a lot of info to digest here and if you have any questions, please feel free to email me at anita@anitalittlestitches.com. The stitch count for all 3 birds are 222W x 137H. Strawberries and birds capture our hearts and are the theme of the first Loose Feather booklet. Each booklet will include a featured pattern and two bonus charts. 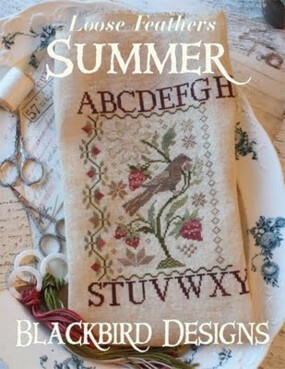 The featured pattern can be individually framed or be stitched into one long piece of linen. The designs can fit together or stand alone as you wish. There will be three Loose Feather booklets in this series. The next booklet will be ready in September and the final one in November. Summer 2011 Loose Feather Thread Pack info. If you want to stitch all three designs (1 featured design and 2 bonus designs), the thread pack will be 20 cotton/silk threads on sale for $68.95 (regular price is $83.30). If you only want to stitch the MAIN/FEATURED design, the thread pack will be 11 Crescent Colors and Gentle Art threads on sale for $19.80 (regular price $22.80). The Silk floss for the bonus pack is $52.15 (regular price $60.50).